kreachr's little corner: Christmas come early? 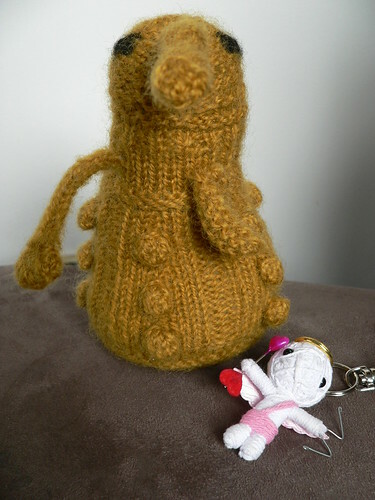 For all you non-Dr. Who fans out there, that funny little brown knitted thing is a Dalek - seriously, how cute is that? Love it! So does Deane. He wanted to steal it to put on his desk at work. I may let him, eventually. And the cute little keyring sitting next to it, very sweet. The top photo is all the goodies in the package all together, then a close up of the non scarf related stuff, and a close up of the cute wee tag that's sewn onto the scarf. I am totally in love with this scarf - it's one of my favourite colours, it's beautifully made, it's soft, and cosy, and just gorgeous!! 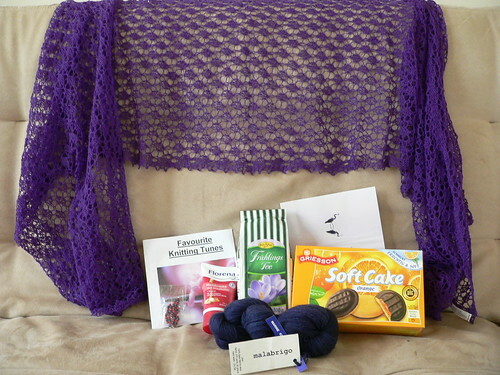 As for the rest of the package - the tea is delicious, the jaffa cakes are absolutely divine (they're my favourite of course), she even made me a CD with knitting tunes - how sweet is that?!? 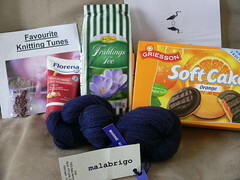 And that malabrigo - mmmmmmmmmmmmmmmmmmmm. Sooooo soft, a gorgeous colour. We can't get it easily in NZ without paying an absolute fortune for it, so this wonderful lady was kind enough to send me a skein - it's lace weight, so I'm going to have loads of fun picking the exact right lace pattern for it, and I'd imagine even more fun attempting to knit it into said lace pattern :-) If I ever manage it, I'll post pics. As for what's on the needles at the moment, still haven't managed to get the other three balls of yarn for X's Gryffindor scarf, hence it's been stuck at 45% done for ages, the squares for the blanket swap aren't required until October so no real rush there, and T's rainbow socks are coming along nicely. However, the yarn is totally cringe worthy. It's hideous!! T picked it, I tried to convince him to pick another one, but he insisted, so ugly clown socks it is. Ugh. There's enough in the ball of yarn to make at least three pairs for him (sigh) but I suppose the main thing is that he actually likes them. I think I'll just make one pair for now, take a break, and attack the rest later when I can work up the courage to do so. I won't scare you with pictures of these socks just yet, I'll let you enjoy the nice pictures above. I've now completed four whole skeins of yarn from the behemoth blob of carded fibre I bought a little while ago, and there's still enough left for at least two more skeins. Yes, I did manage to get Klat going again, I think maybe he was just sulking because I hadn't spent much time with him... 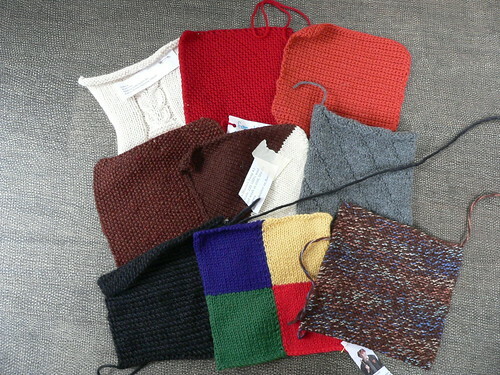 Anyway, by the time I spin it all up, there should be plenty to make X that Weasley sweater. 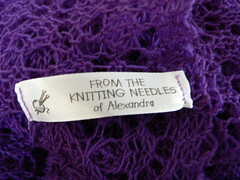 Hopefully it knits up ok - something I haven't yet tested is how my handspun actually looks as a finished product. The red romney is over halfway spun, so I'm going to try and finish that up so I can ply it and decide what to do with it. Hopefully I will end up with enough yardage for a pair of socks, I'm trying to spin it fairly thin. I'll just have to wait and see. Have a nice day everyone, I'm off to the Harry Potter movie this afternoon with X - looking forward to some mother/son bonding time (and the movie of course). Oh and just so you know, I've changed the comment settings on this puppy, so now you can leave a comment and not have to sign up or anything. Some people had mentioned they were going to leave a one but couldn't, so hopefully my computer illiterate self has managed to fix that little problem. Let the comments roll in people!! !